OPPOSING BILL 105: The EMSB has adopted a resolution, opposing Bill 105 which would restrict the ability of school boards to fully and effectively manage and control the school systems which they represent. The EMSB has already submitted this brief to the Quebec National Assembly. NEW OPEN HOUSES SITE: The EMSB has introduced a new website that contains a complete listing of all elementary and high school open houses. It can be accessed at www.emsbopenhouses.com. FACEBOOK CAMPAIGN: The EMSB began a new promotional campaign for our Facebook page (@EnglishMTL) earlier this summer. As a result, traffic has increased significantly, while our likes have gone from just under 4,000 to 6,672 and counting. ÊTRE BILINGUE: The EMSB is thrilled with the positive reaction we have received for our new promotional campaign on bilingualism. To mark the start of the 2016-2017 academic year, the new EMSB slogan “Être bilingue, c’est gagnant!” promotes the fact that being bilingual represents a winning formula. The EMSB has embarked upon a special marketing campaign, complete with specific signage and promotional items, in order to have these words at the tip of everyone’s tongue. “Under the Charter of the French Language, a certificate of eligibility is generally granted to children who did the majority of their elementary or secondary studies in English in Canada; whose mother or father did the majority of his/her elementary studies in English in Canada or whose brother or sister did the majority of his/her elementary or secondary studies in English in Canada. See our TV commercial. The Career Fair was a big success. CAREER FAIR: More than 2,000 Secondary IV students attended the 17th annual EMSB Career Fair on October 19 and 20 at St. Pius X Career Centre in Ahuntsic. Jack Dym of Pipe and Piling Supplies Ltd. and RBC Royal Bank were the event’s title sponsors. CJAD’s Eramelinda Boquer, Breakfast TV’s Catherine Verdon Diamond, Global TV’s Laura Casella and Sean Coleman of CTV/TSN 690 served as guest emcees. 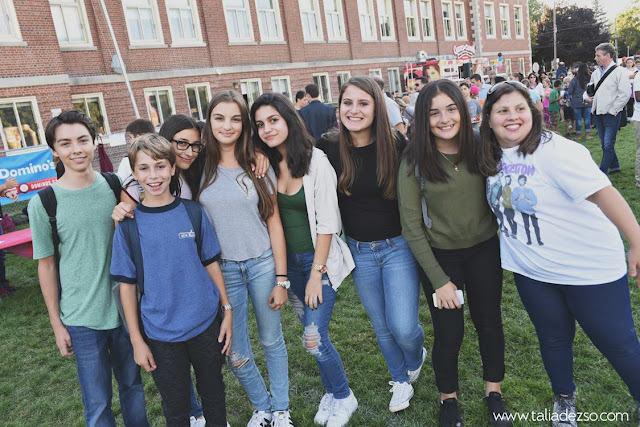 The EMSB also held an open house on the Wednesday evening and this was a huge success, with hundreds of Secondary IV and V students attending with their parents. Karine Thomas, a synchronized swimmer who represented Canada at the recent Rio Olympics was on hand in her capacity as a RBC Royal Bank athlete and she spoke in the auditorium sessions. Karine Thomas meets with students. Harriet Cohen from EMSB Adult Education and Vocational Services is the Career Fair chairperson. The Student Services and AEVS Departments of the EMSB coordinate this program. Ms. Cohen notes that the main objective of the Career Fair is to provide students with an in-depth exposure to the various educational opportunities available to them. All students took part in a brief general information session in the St. Pius X auditorium and watched a specially produced video. Students then had the chance to visit the various exhibition/information booths staffed by representatives from English vocational centres, CEGEPS, universities and some private business colleges. See the coverage on Breakfast Television. As well, here are a collection of photos. PARENT COMMISSIONERS: Jason Trudeau (elementary), Mario Bentrovato (high school) and Joanne Charron (ACSES) have been re-elected as EMSB parent commissioners for another two year term. Norm Gharibian is the new parent commissioner (no designation). He succeeds Andrew Ross, who decided not to put his name up to return. "Since an early age service and volunteering have been a big part of my life," says Mr. Gharibian. "I have served as a youth community leader, Scouts Canada member then leader, coach, and as a parent I have been involved in public education at many levels. I am a proud parent of two wonderful children. I am honoured and humbled by the trust placed in me by the parents of the Central Parents' Committee and look forward to earning that trust over the course of my mandate." AEROSPACE EXPERT: Brian Ewenson, an aerospace educator, consultant and professional speaker, visited four elementary schools – General Vanier and Pierre de Coubertin in St. Léonard and Coronation in Côte des Neiges and Pierre Elliott Trudeau in Rosemount- and provided his engaging presentation entitled "Living and Working in Space: No Shower, No Shoes...No Problem!" Brian Ewenson at General Vanier. Mr. Ewenson`s visit to the Kennedy Space Center at the age of four launched his lifelong career of reaching for the stars! Anyone can be inspired at any age. This message is part of each of his presentations. With programs for various age levels, he intertwines his personal experiences with science activities, audience-participation, and fun all while students learn about space science topics! Brian Ewenson at Pierre Elliott Trudeau School. Mr. Ewenson is recognized as a top aerospace expert in Canada and NASA's space programs, appearing on radio, TV, and in newspapers. He is an Educator Associate for the American Institute of Aeronautics and Astronautics (AIAA) and serves on the board of advisors for the SciEnteK-12 Foundation. He has shared his experiences as an aerospace educator with over 100,000 people across North America in hands-on/minds-on presentations using authentic space program hardware. With one of the largest personal collections of space-related memorabilia in North America, he brings space experiences into your school. His audiences range from five-year-olds to engineers and scientists. 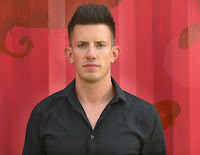 For more information on the speaker, log on to www.brianewenson.com or follow him on Facebook at www.facebook.com/bespaceman1. PROM QUEEN THE MUSICAL: Royal West Academy will be holding their fundraiser for a new auditorium at the Segal Centre with nearly 150 guests attending Prom Queen: The Musical on Thursday, Oct 27. This will mark the world premiere of an outrageously fun, new musical celebration about being true to yourself in the face of adversity. Prom Queen: The Musical is based on the true story of Marc Hall, the Ontario teen who took his Catholic District School Board to court for the right to bring his boyfriend to prom. His fight for equality rallied a town, made international headlines and inspired a nation. Created and developed by an all-star, all-Canadian team. A limited number of tickets for the Thursday evening performance have been made available as a special fundraiser for Royal West Academy in support of the new auditorium. Marc Hall will be in Montreal and visit Royal West on Tuesday November 1 from 12:30 to 1:15 during the students lunch hour. Marc will speak for about 20 minutes and then answer questions. Royal West has a fantastic LGBTQ (Lesbian, Gay, Bisexual, Trans, or Questioning) student club. Royal West Academy students celebrate. START OF THE YEAR EVENT: The Royal West Academy Foundation recently held their annual Start of the Year celebration, promoting school spirit and raising funds for the school and various projects, namely the school’s new auditorium. They wish to extend thanks to Talia Dezso Photography for the wonderful pictures. For more information on the Royal West Academy Foundation, please visit: www.rwaf.ca. 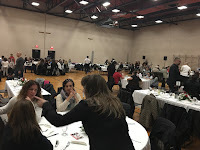 PASTA DINNER AT OUR DAY POMPEI: The annual Our Lady of Pompei Elementary School Pasta Dinner fundraiser was held on the evening of October 14 at Pius X Culinary Academy. It was a pleasant evening for all and it was a great opportunity to have the community come together and support Our Lady of Pompei School. The event was once again a great successful with over 250 attendees. MACKAY GROUNDBREAKING: The official groundbreaking ceremony for the new $21.9 million dollar state-of-the-art facility for the Mackay Centre and Philip E. Layton Schools will take place on Wednesday, November 2 (Noon). The facility will be built on a now empty piece of land located on Terrebonne Street, between Benny and Madison Avenues, in NDG. The EMSB has owned the green space for decades. The field is currently under municipal custodianship and is being used as an informal playing field by the public and the neighbouring Commission scolaire de Montréal (CSDM) elementary school École Marc-Favreau. The new school will house approximately 200 students with developmental, intellectual, auditory or visual impairments and will be the only one of its kind to offer specialized educational and rehabilitative services for the Anglophone community. Its supra-regional mandate means that students from all nine Quebec English School Boards will be attending this school. Some students must by travel as much as three hours per day by school bus. The Arctic at John Paul I.
ARCTIC VISITS: Players from the St. Léonard/Montreal North Arctic Junior AAA hockey team have begun their annual visits of East End EMSB schools. The team plays its home games at Garon Arena in Montreal North. Many of their players, not to mention head coach Gianni Cantini, are EMSB alumni. They have stopped by John Paul I Junior High School in St. Léonard and Leonardo Da Vinci in RDP. At Leonardo Da Vinci Academy. DECISION ON SINCLAIR LAIRD PARK: The EMSB Council of Commissioners heard its parents loud and clear and as such will no longer entertain the idea of selling part of the park on the grounds of Sinclair Laird Elementary School in Park Extension to a private childrens’ daycare operator. On September 26, the EMSB held an information meeting for parents of children attending Sinclair Laird on the possible sale of a small section of the schoolyard to a private daycare owner to build of a new facility on school grounds. At that meeting, Council members and representatives from the EMSB shared information regarding the request and provided an opportunity for parents to voice their opinions on the matter and ask questions. Parents were requested to complete an exit card indicating whether they wanted the EMSB to either, continue the discussions and use the revenues from the sale to make improvements in the park section, or stop the process at this time. Thirty-four parents who were present completed the survey, and all indicated that they did not want to continue the process. An overwhelming number of parents indicated that they wanted to keep the park as green space for the school and community. At the last meeting of the Council of Commissioners on September 28, Administration presented the results of the survey. It was subsequently agreed to stop the process effective immediately and maintain the green space as a schoolyard and park. EMSB Chairman Angela Mancini has extended her appreciation to the school community for its important feedback. “Council will continue to work with school communities in order to best serve the needs of students and parents,” she stated. MY DAYCARE IS ACTIVE: The Direction régionale de santé publique de Montréal, in collaboration with Montreal’s five school boards, encourages all school daycare services to get children to move at least one hour a day, in safe and playful environments. Children who play well... learn, succeed and grow well. Five ways to encourage the practice of physical activity: Ask children what types of physical activities they want offered in the daycare; Ensure that there is enough equipment for children to be physically active; Bring the children outdoors as often as possible; Offer physical activities set in different environments (gymnasium, classroom, schoolyard, park, etc. ); and Encourage children to participate in physical activities, and put emphasis on having fun. One of the My Daycare is Physically Active committee's initiatives was to produce a series of six videos: three in English and three in French, funded by participACTION. These videos were officially launched province-wide on September 30. Here is one featuring EMSB Physical Education and Health Consultant Katherine Baker. Stephanie Janusauskas and Wendy Frank. TV STAR RETURNS: Teenage television star Stephanie Janusauskas returned to her former elementary school, Royal Vale in NDG on October 17 to talk to drama students about her career as an actress. Stephanie is one of the stars of CBC TV’s This Life. She plays Emma Lawson-Crowley, an image-conscious but mostly well-adjusted teenager who worries more about her social life than her future. The storyline of the show revolves around a character named Natalie Lawson, a lifestyle columnist and single mother in her early forties whose terminal cancer diagnosis sends her on a quest to help her three teenage children get ready for the future, while trying her best to live in the now. It is set and recorded in Montreal, mainly NDG. Stephanie with some students and staff. Stephanie began acting in performance theatre at the age of six years old. At eight years old, after only a few months of being in the film industry, she landed the role of Grace in the Marvel film Punisher: War Zone. She has appeared in a handful of feature films including Picture This, Reverse Angle, The Saver and was the principal actor in the short student film, Baby Doll, winner of the 2012 Concordia Film Award. Presently a student at Dawson College, Stephanie has an incredible passion for acting, she remains studious and aspires to study at Oxford University in England. She spoke to the Grade 7 Drama classes of teacher Cynthia Bennett and a number of Grades 5 and 6 students. Stephanie was introduced by Wendy Frank, one of her former teachers. The questions were so numerous that Stephanie promised to come back and speak with Ms. Bennett's classes. Here are some photos from her visit. Meghan Benfeito, with staff and students. 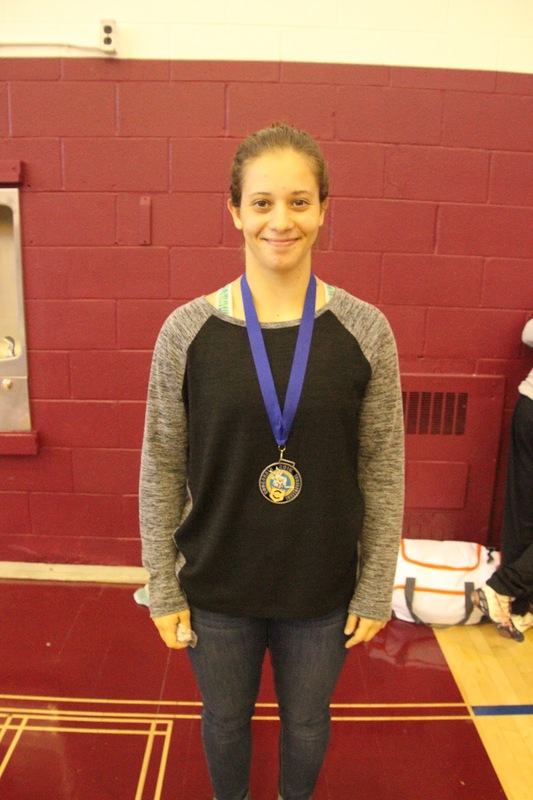 DIVING INTO ROYAL VALE: Olympic diver Meghan Benfeito is a hero for Canadian youth. On September 29 she joined 460 students at Royal Vale School in NDG to pay tribute to another Canadian hero, Terry Fox. 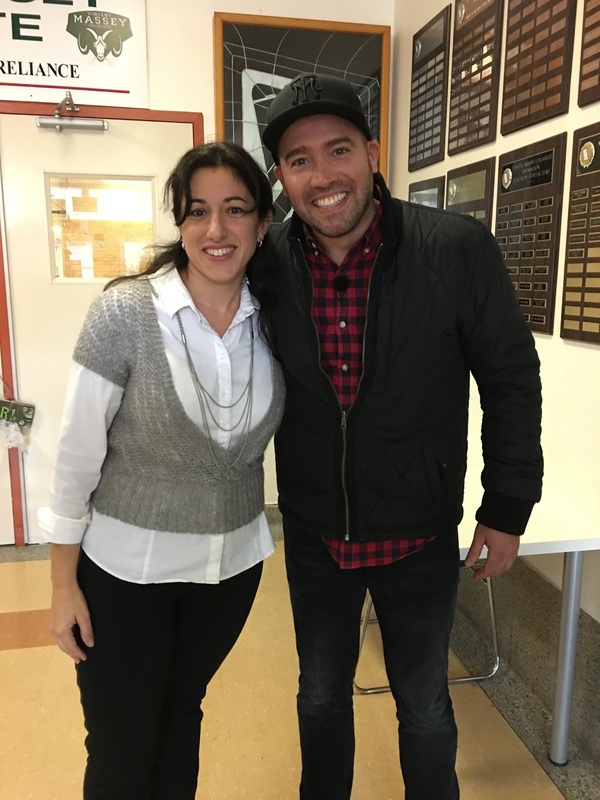 Benfeito, a two-time Olympian and three-time Olympic bronze medalist, delivered an inspiring address to students before joining them on their annual Terry Fox walk. URBAN BEEKEEPING: This September had a unique surprise for students returning to classes at seven of the EMSB's schools. After installation and a successful series of workshops last year, the beehives installed at Elizabeth Ballantyne Elementary, FOCUS, John F. Kennedy High School, Laurier Macdonald High School, Royal Vale Elementary and High School, Royal West Academy, and Westmount High School, were now stacked high with boxes filled with frames of honey. The Bee team at Royal Vale. Across the island students at these schools were involved in the final series of workshops presented by Alvéole's professional beekeepers, the pinnacle of which was gathering the honey frames from the hives for the extraction workshop. Alvéole visited each school with a portable hand operated honey extractor, filters, and jars. The beekeepers began the workshops by explaining to the students the life cycle the bees and their hive were currently experiencing and then answering the students' many questions. They also discussed how the extraction process the students would be involved in compared to commercial methods. Afterwards, the students were delighted to be able to fully participate in the actual extraction of their honey. They uncapped frames, spun the extractor, poured honey through filters, and filled jars. The students started with raw honeycomb and ended with delicious liquid honey! With extraction complete, the schools are now happily enjoying their honey while the bees prepare to hibernate for the winter. Students and bees alike agree that this first year of urban beekeeping was a success at EMSB. The project will continue in the spring when the flowers bloom and the bees are ready to begin working again.For schools interested in participating in urban beekeeping next spring, they can contact Travis Hall, Career Development Consultant at THall@emsb.qc.ca or 514-483-7200 ext.7318. The project provides an exciting and unique opportunity for schools to support the Guidance-Oriented Approach to Learning (GOAL) philosophy. The process of tending hives and observing bee activity is cross-curricular and enables students to learn about biology, agriculture, ecology, nutrition, and business in a practical hands on manner. The workshop leader at Royal Vale pictured here was one of Alveole’s three founders, Alex Mclean. The St. Monica soccer team at the jamboree. SOCCER JAMBOREE: Over 300 students from 15 schools participated in the annual Jamboree, promoting friendly competition and physical fitness. It was held at Royal Vale School in NDG. Here are some photos. Ms. Belinsky gets ready for her haircut. And off goes her hair. WILLINGDON’S INCREDIBLE TERRY FOX FUNDRAISER: Willingdon Elementary School in NDG has a dedicated and much-loved Physical Education teacher, Lara Belinsky, who organized this year’s annual Terry Fox Run. She pledged that if the usual donation of around $8,500 could be doubled to $15,000 she would shave her head! The fact that she has a huge mass of black curls that can extend up to a foot across on either side of her face when it is brushed out made this quite the revelation. The school went beyond the initial goal and raised $26,570. On Friday, October 14 not only did Ms. Belinksy proceed with her big shave event, assisted by hairdressing students from the EMSB’s Laurier Macdonald Career Centre in St. Léonard, but other staff members went through with dares of their own Some of them included: Science teacher Kathleen Usher pledging to kiss the school turtle for $8,000; Junior Physical Education teacher and long-time Bruins fan Jonathan Stein agreeing to come to school as a Habs cheerleader for the day; music teacher Nick Batzios pledging to come dressed as a rock star; Vice Principal Vito Campell-Guerriero agreeing to a pie in the face for $13,000; and Principal Carmen Nicolas agreeing to a full out karaoke performance in front of the entire school. Ms. Belinsky and Ms. Nicolas were on CJAD’s The Night Side program with Natasha Hall the night before the big event. Mr. Daskalakis and his clip. MR. DASKALAKIS CUTS HIS HAIR: On Friday, September 30, 2016 St. Gabriel School walked, jogged, and ran to raise funds for cancer research for the Terry Fox Foundation. The students and parents raised $2, 915.50 and true to his word Principal Jim Daskalakis cut his hair after his objective of $1,200 was achieved. QFHSA CONFERENCE: The Quebec Federation of Home and School Associations will hold its Fall Conference on Saturday, November 5 at Beaconsfield High School (250 Beaurepaire) from 8:30 am to 3:30 pm. Learning The Lessons of History: Creating A New Narrative for Canada is the theme. Nakuset, the executive director of the Native Women’s Shelter of Montreal and creator, producer and host of the TV series Indigenous Power will be the keynote speaker. There will also be a panel discussion on changes to the history and social studies curricula at both the elementary and secondary levels being examined across Canada. How much of our history has been ignored or left out entirely? One clear example involves Canada’s behind the scenes true relationship with its Indigenous peoples. The time for truth and reconciliation is long overdue. An exciting panel of educators will provide their perspectives on why changing our narrative is necessary to understanding who we are as a nation. Our children deserve a legacy of truth in the telling. Westmount High School teacher Robert Green is one of the panelists. He believes that Quebec needs a history curriculum that is focused on its francophone majority, yet inclusive of the significant contributions of its minority communities. Workshops are planned on: Cultivating and Enhancing your child’s self-esteem; Uncovering the Mysteries of Anxiety; and Volunteering Matters - Mission Driven Volunteering. Two literacy workshops will focus on Quebec Reading Connection and whether books in our schools reflect our society’s diversity and cultural identities. The registration fee is $25 for Home and School members and $35 for the general public. Info: sheiladesormeaux@qfhsa.org, 514-481-5619 or www.qfhsa.org. See the flyer. WORKSHOP FOR GRADE 5 AND 6 STUDENTS: Dr. Alyssa Sklar, founder of Risk (within) Reason, will be giving Royal Vale, Edinburgh and Willingdon Grade 5 and 6 students, along with their parents, a talk on Digital Citizenship and Responsibility. This will be held on Thursday, November 3 from 7 pm to 8:30 pm in the Royal Vale auditorium. Risk (within) Reason is a Montreal consultancy project focused on teens, technology and risky behaviours. Dr. Sklar has also taught at Concordia and worked as a researcher and consultant in adolescent risk prevention at McGill. This is a very worthwhile discussion for students about what they need to know about engaging in safe, respectful, creative and productive use of technology and for parents about how we can teach our children to put these technologies to use in ways that are creative and productive, but also safe and responsible. For more information on Dr. Sklar please visit the website: www.risk-within-reason.com. 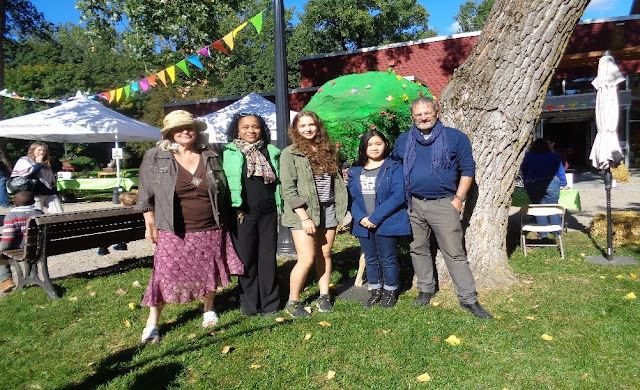 L to R: Guy Deziel from Vert-Cité, Community Partner; Alan De Sousa, Borough Mayor; Katherine Dimas, CLC Coordinator,; Marylene Perron, Principal; Elpi Argyrakopolus, Consultant and students. HARVEST DAY: Parkdale Elementary School in St. Laurent participated in Harvest Day in the borough of St. Laurent. EMSB STUDENTS SING: Last June 23, at the Grande Spectacle de la Fete Nationale du Québec a Montréal, 40 out of 60 children in a special choir were from EMSB schools and got to sing on stage with Quebec legend Jean Pierre Ferland in front of 50,000 spectators in Place des Festivals. The next day it was aired in its entirety by Ici Radio Canada and here is the clip. On October 3on TVA`s La Voix Junior, EMSB students were shown in a pre-recorded segment participated in the recorded the theme song of LA VOIX Junior-Nous Chanterons under the direction of Dimitris Ilias. Following the audio taping they filmed four episodes singing and cheering the three coaches. The show draws millions of viewers from all over Quebec. See the Facebook page. COUBERTIN PARTNERS WITH PAPER: As of October 27, Pierre de Coubertin Elementary School in St. Léonard will be publishing in Il Corriere Italiano once a month. Teacher Carmela Bonifacio will work on projects with the students in various grades. That work is assembled by the students in the Italian Club. They take pictures and send them to the publisher of the newspaper. “We will have one page in the newspaper every last week of the month,” said Principal Ida Pisano. The page is called I ragazzi di PIERRE DE COUBERTIN. Cutting the ribbon at the new yard. NATURE’S WAY SCHOOLYARD: With a seemingly endless summer, students at St. Gabriel Elementary School (600 Dublin) and children in Pointe St. Charles have enjoyed a revamped school yard: an innovative space that marries the outdoors, nature and physical activity in an urban setting. The schoolyard, dubbed Nature’s Way, was officially be inaugurated on October 14. “This school yard was created for the students and the community to have fun, enjoy the outdoors and discover nature,” said Principal Jim Daskalakis. “It emphasizes the wonderment of biodiversity and community participation. Our schoolyard was previously a concrete heat trap, now it is an oasis of nature and sport.”The school yard was made possible through the collaboration of St. Gabriel School, the English Montreal School Board, the City of Montreal and Éco-Quartier. See our video. Catherine Verdon Diamond of Breakfast TV at Rosemount High School. EMPOWER YOURSELF: Rosemount High School is partnering up with Breakfast Television on a community action program developed by Vince Lacroce, Spiritual and Community Animator, entitled "Empower yourself, inspire others." This year-long service-learning program is designed to empower students to become advocates of their community and educate them on monthly virtues. In addition, these television segments will allow Montreal television viewers the opportunity to learn about local social issues by experiencing a hands-on collaboration with everyday Montrealers and modern day high school students. Breakfast Television, along with their television personalities, will be joining Mr. Lacroce throughout the year on programs/ activities such as the Benedict Labre House Visitations, Remembrance Day Commemoration Ceremonies, Huggies Valentine's Day Toy and card drive for the Montreal Children's Hospital, and the Cook for a Cure Alzheimer's Book Launch for the Montreal Neurological Institute. ROSEMOUNT REPORTER: On September 21, Rosemount High School officially launched its first ever interactive online newspaper call The Reporter. This will be a newspaper written by the students of Rosemount High School. The purpose of the newspaper will also be to showcase the talents, accomplishments, and initiatives of RHS school community and will be overseen by teacher Jacklyn Di Genova and Spiritual and Community Animator Vince Lacroce. The Reporter will be published once a month and will highlight school events in conjunction with various themes and virtues meant to promote a positive school and community environment. Joel Ceausu, journalist at The Suburban Newspaper, conducted an interactive workshop for the RHS newspaper reporters and editors. Mr. Ceausu has been writing for The Suburban since 2008. A Laval native and Concordia Journalism school graduate, Joel snagged minors in History and Political Science before going on to spend his adult life scribbling. For two decades he freelanced for more than a dozen trade publications and various periodicals across the globe, writing on topics as diverse as home decor, HR, agricultural and defence technologies and more, including small business and real estate issues for a major North American daily. This interactive workshop will be followed by a Photography and Adobe Photoshop training by Mr. Lacroce and Rosemount Technology staff members. Click here to read it. BACK TO BASE-ICS: Students at Rosemount High School are set to embark on a mentorship program with students enrolled in the EMSB’s Before and After School Enriched (B.A.S.E.) program. Under the guise of Mr. Lacroce, Back to B.A.S.E-ICS will allow students the opportunity to reach to their old elementary schools and serve as mentors for its students. The program will reiterate several core components already provided the B.A.S.E program such as academic assistance, sports and green programs, as well as a myriad of other cultural and social activities. “The program will provide students with an opportunity to give back to their community and to develop an attitude and learn the value of generosity and giving,” said Mr. Lacroce. “It is also an opportunity for them to model positive behavior in mentoring to their younger companions.” Back to B.A.S.E-ICS will be take place weekly at: Pierre Elliott Trudeau Elementary School in St. Michel, Dante School in St. Leonard, Dalkeith Elementary School in Anjou and Nesbitt School in Rosemount." INTERNATIONAL DAY OF PEACE: Each year the International Day of Peace was observed around the world on September 21, to mark this special occasion, students at Perspectives I High School will be embarking on a new program to promote dignity, respect and equality. This program will be overseen by Barbara White, Head Teacher at Perspectives I, student tutor Claudia Ciavaglia, teacher Stephanie Gervasi, and Mr. Lacroce. The program will commence with the introduction of Yoga and meditation. The goals of the yoga presentations are to educate the students about the importance of developing their physical qualities (strength, flexibility, and coordination) as well as the mental and emotional benefits (improved concentration, confidence, and self-control) that Yoga provides. Mediation will be incorporated throughout the year to help students center themselves and help them improve communication and gain clarity and peace of mind. Students will be creating an art piece, where they will be tracing their hands and writing positive messages about themselves and others. The artwork will be displaced around the school. On September 26, the Missing Children’s Network provided the students with general information about their organization, an overview of current missing children statistics, some examples of real-life cases and the importance of being kind and respectful to others. See this video. International students show their colours. INTERNATIONAL STUDENTS: EMSB international students from Marymount Academy International had a field trip to Arbraska Park in Rigaud (zip-lining Park) on October, with a total of 25 students enjoying a day off outdoors. These were students from Germany, Spain, China, Korea, Japan, Mexico, Chile, India, Brazil, Vietnam and Austria. You can see their Facebook page for photos. 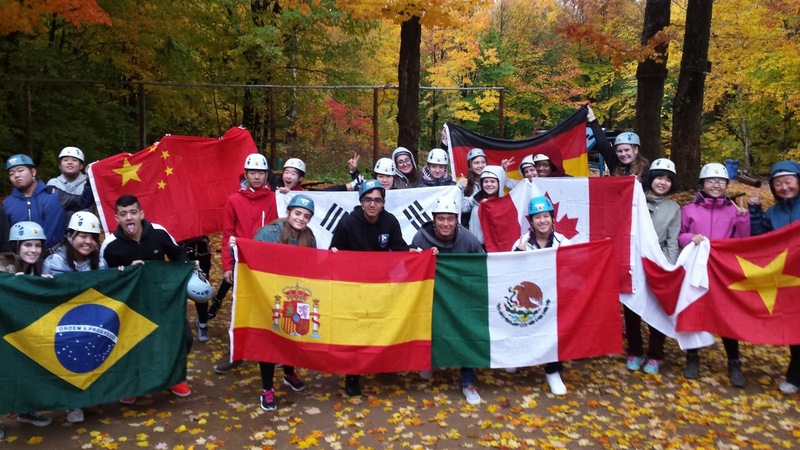 Students from Westmount High, Rosemount High and JFK went on Oct.21 while LaurenHill students had a trip on Oct. 28. DUNRAE GARDENS WINS MEDAL: With Canada’s sesquicentennial birthday only months away, Dunrae Gardens Elementary School (235 Dunrae) in Town of Mount Royal will be celebrating in style, having been chosen to host one of 150 Celebration Gardens across Canada. The garden will be planted on Thursday, November 3 (1:35 p.m.).Awarded by the Canadian Garden Council, in collaboration with Vesey’s Bulbs of Prince Edward Island, the garden will consist of 500 red and 500 white tulips. This particular flower was chosen as it is an international symbol of friendship, ensuring that the garden will serve as an enduring symbol of Canada’s ethos of kindness and hospitality. “We feel very fortunate to have received one of these Gardens,” said Principal Elena Zervas. “Our garden will be symbolically linked to the others across Canada as well as to the flagship 150th Celebration Garden Promenade, consisting of 25,000 tulips, in Niagara Falls.” Dunrae Gardens School would like to thank Pietro Gasparrini for submitting the winning ‘150th Celebration Garden’ application as well as all those that made this heartwarming program possible: Canadian Garden Council, Vesey’s Bulbs, Canada Post, Canadian Nursery Landscape Association, Niagara Parks Commission, Garden Making magazine, Landscape Ontario, Ontario Garden Council, Baxter Travel Media, Enterprise Canada, Gardens BC, Québec Gardens’ Association and VIA Rail Canada. Taking advantage of the great outdoors. The students also took time to plan community based conservation action projects that will be implemented this year. The trip also allowed all the students to make new friends, share ideas and work on projects aimed at appreciating and conserving nature. COMMUNITY LUNCH: Students from Vincent Massey Collegiate in Rosemount recently held a community lunch, kicking off the 12th year of their partnership with the Ste. Anne’s Veterans Residence. The partnership, formed by Spiritual and Community Animator Rocco Speranza in 2005, has allowed countless students to visit veterans, share meals, stories and most importantly, provide company to countless seniors over the 12 years. Following the lunch, in addition to several visits and meetings, students keep in touch with the seniors via a letter writing campaign. “Experiences such as this one allow our youth to connect with seniors, create friendships, while making links to the past,” said Mr. Speranza. “Importantly, it also allows students to develop their inner life values, becoming compassionate and contributing members of society." The community lunch was made possible thanks to the support from VMC administration and staff, Ste. Anne’s dedicated staff and volunteers, Mrs. Didi, students who prepared the wonderful desserts, Mrs. Thompson and her art students who prepared decorations as well as co-organizers Mr. Cavallaro and Mr. Trimboli. 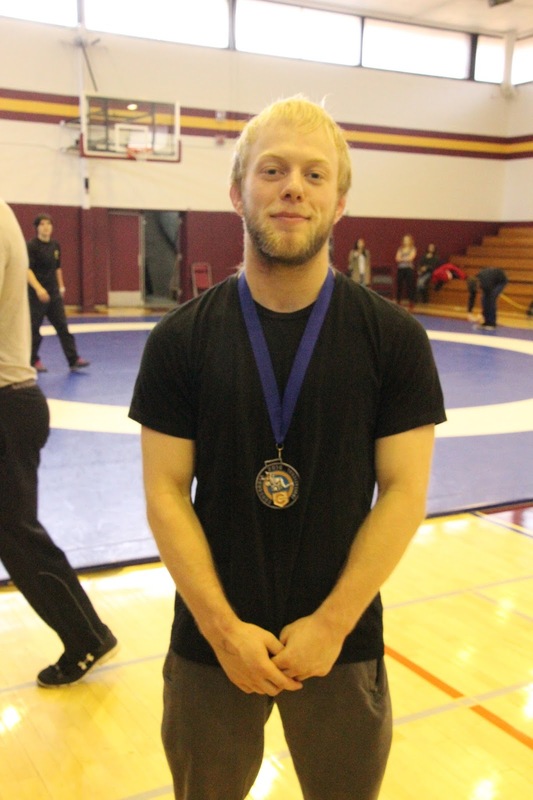 WRESTLING ALUMNI: Two alumni from the Vincent Massey Collegiate Wrestling team medaled at the Concordia Invitational Wrestling Tournament Francis Carter (left), wrestling for Concordia University, took home a gold medal at 65 kgs while Amanda Savard (right), wrestling for Vanier College, also took home a gold at 61 kgs Women. Stefano Faita and Principal Franca Cristiano. CHEF FAITA RETURNS: Celebrity chef Stefano Faita returned recently to visit his former high school, Vincent Massey Collegiate. He is a 1993 graduate. Chef Faita hosts his own popular TV program on CBC and TLN, which brings his fun, casual approach to cooking, inspired by his family's traditions and rich food history/ The trilingual chef, a family man is famous in French-speaking areas of Canada, lets viewers in on generations of cooking secrets while telling candid family stories. Each episode features a particular theme, and Faita prepares at least two simple recipes related to the theme. In addition, Faita also answers common cooking questions and highlights time-saving kitchen gadgets. Shot in front of a live studio audience, In The Kitchen showcases Stefano at his best -- interacting with audience members and teaching cooking techniques and methods in an informal, cooking-school-like atmosphere. “Since the age of four, Tedario has attended Remembrance parades, lead poppy campaigns, organized Remembrance Day projects and has visited our Canadian heroes at their assisted living residences,” said Rocco Speranza, his father and Spiritual and Community Animator at the EMSB. Tedario will also be part of the “WE Canada 150” public service announcement that will air during the We Day tour in November and December. The PSA was filmed during his time in Toronto. 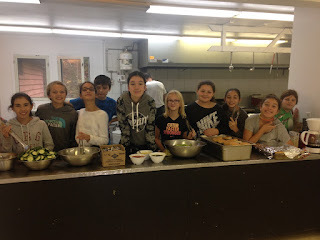 Students prepare their own meals. PEARSON AND NESBITT: Nesbitt Elementary School’s Grade 6 classes and Lester B. Pearson High School’s Student Council experienced a two-day crash course in empathy and teamwork. The camp represents the third year in a row the two schools have worked together. Grade 6 students were challenged through ice breakers, energizers, experiential activities and a multi-faceted anti-bullying workshop. Students from Lester B. Pearson High School’s Student Council designed two days of activities to promote teamwork, independence, accountability and respect. The intention is to better equip the participants for the year ahead and beyond.The camp was run in collaboration with the Sun Youth Organization, Nesbitt Elementary School and Lester B. Pearson High School. In addition to the leadership program, Nesbitt students had an opportunity to take advantage of Sun Youth Camp's beautiful surroundings and go kayaking, wilderness hiking and roast marshmallows by the campfire. 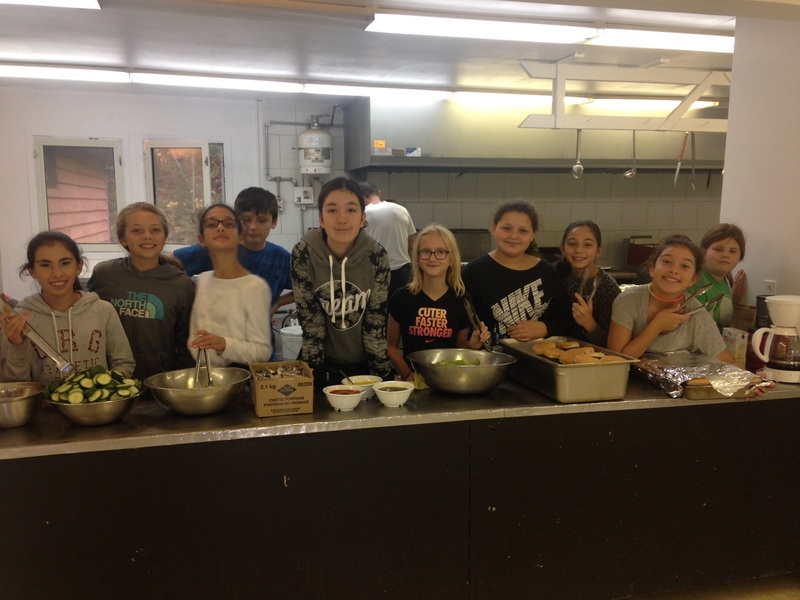 Grade 6 students even prepared and served their own meals under the guidance of their master-chef teachers. 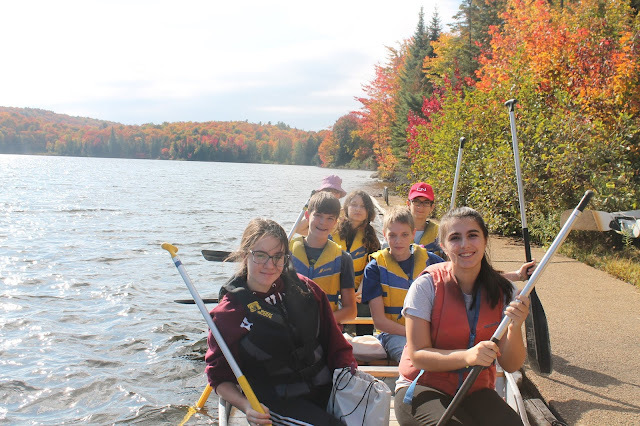 Both elementary and high school students returned from camp wiser, more mature and independent through shared experiences and mentorship. Everyone benefits when students collaborate with one another. CORRIDOR VERT: The City of Montreal borough of Montreal North signed an important agreement with the Commission scolaire de la Pointe-de-l'Île (CSPI) and the EMSB last year in the implementation of an innovative Green Corridor project. This concerns the area between Pascal (north), Renoir (south), Rolland (east) and Laurier (west). Mayor Christine Black, Angela Mancini, Sylvia Lo Bianco and Gerald McShane Principal Christina Chilelli. This is unique for the fact that in this small half a kilometre space are five schools, two parks, a cultural community centre/library, an arena and a public pool. Over 6,000 students, parents and teachers pass through this area every day. The five schools are Gerald McShane Elementary and Lester B. Pearson High from the EMSB, École Secondaire Henri Bourassa, École Jules Verne Elementary and École Carignan. The details of the Green Corridor project were showcased on October 5 with a complete tour of the different stations. Over the next four years considerable efforts will be made in this busy area in order to create a pleasant living environment and make it an accessible, active and friendly atmosphere. The agreement between the two school boards encompasses: being part of a roundtable discussion group with the borough; participating in the production and implementation of an integrated project portfolio; defining the needs for green space, development, mobility and mobilization; supporting the development of an educational program and environment of animation; collaborating with local organizations that might be involved in several aspects of this project; and to make a school travel plan. Lester B. Pearson High School students showcase their display. Interventions will include: planting trees and greenery, urban agriculture and the development of shaded areas; the layout of passages and other links between schools, public buildings and parks; studying the impact of traffic patterns; promoting Incentives to use public transportation; taking a closer look at how students get on and off school; buses; road markings; creation of a new urban footprint; and making the best use of public spaces. Students walk for a cause. 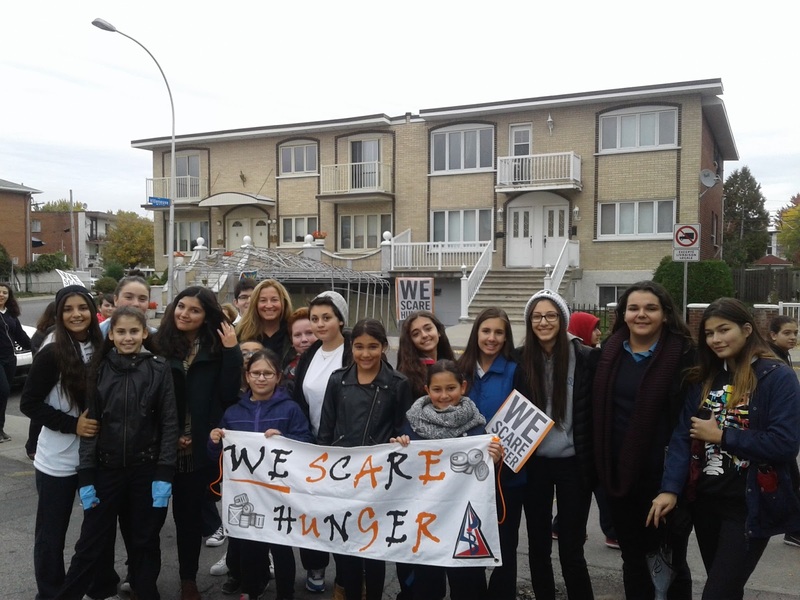 WALK TO END HUNGER: Lester B. Pearson High School students have taken a stand against hunger in Montreal North for the fourth year for La Fondation Beaulieu-Blondin. This year they were joined by students from Gerald McShane Elementary from Grades 3 to 6 who are running their own food drive and led the way through a walk around Montreal North. During the entire month of October, LBPHS is collecting non-perishable food items through Halloween events and goodwill donations. The month-long campaign was kicked off through the walk around Montreal North and will conclude on November 1. The annual event is organized through a partnership with We Charity’s (formally, Free the Children) We Scare Hunger initiative. Hunger is a real problem in this community, with more struggling to put food on their tables every day. EVENING WITH PORTAGE: In partnership with Portage, the Laurier Macdonald High School CLC is hosting “An evening with Portage” on Wednesday, November 9 (7 pm to 8:30 pm). The event is a free information session on prevention for elementary and high school parents. BATTLE OF THE MINCRAFTIA: Here is our video with Dante Elementary School student Gianluca Rinaldi about his new book with EMSB’s TV’s Taylor Yankowski. LITERACY AT CORONATION: Marymount and Coronation students in collaboration with their spiritual animator, Linda Luca and Marymount librarian Evelyne Beaulieu have initiated a literacy program at Coronation, entitled, “One World, Many Stories.” Marymount students have volunteered to read their favorite storybooks to Pre-K, K and Cycle 1 Coronation students once a month. The goal is to foster love of books and reading. This initiative also promotes community, literacy, and peer to peer authentic learning opportunities. INSPIRATIONS EXPRESS: The special online edition of Inspirations Newspaper, a snapshot of our special needs community, has been published. Please give it a read. There are stories about autism, the Kids Write Network, a documentary film on the I Can Dream Theatre, the Rio Paralympic Games, questions to ask a teacher and much more. NATIONAL PRINCIPALS’ MONTH: There is a new initiative that The Learning Partnership has been spearheading this month: National Principals’ Month. We all know that great principals make great schools and can have a profound impact on a school’s students, teachers and the community as a whole. The Learning Partnership has been driving a public relations campaign to raise awareness about the crucial role principals play in public schools and communities across Canada. October 2016 is the inaugural National Principals’ Month in Canada! During the month, everyone is invited to spread the word about the campaign by highlighting outstanding principals in their network, sharing their stories, joining the conversation on Twitter with the #OutstandingPrincipals hashtag, and encouraging others to do the same. You can also nominate a principal for the Canada’s Outstanding Principals award, the only nationally recognized award and executive leadership training program for principals in Canada. MEDIA LITERACY WEEK: Media Literacy Week is October 31 to November 4. This year’s theme: Makers and Creators will focus on hands-on media creation. Media Smarts, along with its partner the Canadian Teachers’ Federation, will celebrate the ways parents and teachers can help young people become more creative, innovative, and entrepreneurial by embracing media production, remixing, maker, Do it Yourself culture and coding. NEW KIDS CRICKET COURSE: Want an amazing new activity for your kids? Ministry of Cricket & Other Homeless Sports is offering an indoor kids cricket course for ages 5-11, Sundays 10am-11am, running eight weeks. It began on October 23. With qualified coaching, the course is set in the best cricket facility in Canada, opposite Marché Central! The cost is just $96 taxes included. Visit www.ministryofcricket.ca or email info@ministryofcricket.ca now to register! Come try the second most popular sport in the world! FACE TREE PROJECT: Based on the idea that literacy has a broader concept than just reading and writing of the written text, FACE School teacher Simone Nichol’s latest arts-based project saw 25 Secondary III students broken up into teams of four. In conjunction with the artist in residence, the students made huge papier maché trees and devised their very own Declaration of their Responsibility to Future Generations. Doing collaborative arts-based learning moves away from those "traditional educational" spaces, which has been founded upon the rational and abstract, one that segregates, ranks and measures individuals. This project opened the space for collaboration, discovery and adventure minus the measurement of output. As part of community outreach, the trees were part of the official opening of the Forêt Frédéric Back at FACE last June. Over the weekend of September 24 and 25, Nathalie Gagnon, Director of the Frederick Back Tree Pavilion at the Botanical Gardens, invited the students and their trees to be part of their 20th anniversary celebrations. Many students came to the gardens too. They were able to speak about their project to members of the public. It was a huge success. This demonstrate how art-based projects are open to community partnerships and collaborations. NOMINATIONS SOUGHT: Black Theatre Workshop is once again giving out the Victor Phillips Award with a value of $1000 to an artist under the age of 20 who excels both in academics and in the performing arts (theatre, music, dance, spoken word or interdisciplinary arts.) The student must reside in the Montreal region. The award will be presented at the 31st annual Vision Celebration Gala which will take place on January 28, 2017. If you know of a student who excels both academically and artistically, make sure to forward them this information or feel free to nominate the student yourself. For application guidelines and forms, visit http://www.blacktheatreworkshop.ca/nominate-a-young-artist. Deadline for submissions by mail, email or online is November 27. BLACK THEATRE WORKSHOP 2017 SCHOOL TOUR: For Black History Month, February 2017, Black Theatre Workshop is thrilled to bring back the popular and acclaimed Bluenose, by Emil Sher, a music-filled play that uses theatre and clowning to explore culture clash, bullying, resiliency, acceptance and difference from the playful perspective of a group of zany pirates. RATT, SPLATT AND KNAT are 3 red-nosed pirates whose lives are predictable on the blustering seas until… KU, a confident blue-nosed pirate, washes up on deck. Emil Sher’s Bluenose is a relevant and entertaining way to get young audiences to “LOOK BEYOND THEIR OWN NOSE.” The show is most appropriate for Kindergarten to grade 8. On tour from February 6-26, 2017. A study guide is provided. Contact Black Theatre Workshop today to book a date by telephone: 514-932-1104 ext. 228; or email: schooltour@blacktheatreworkshop.ca. KIDCON: The EMSB had an information booth at KidCon, the two-day event for kids and families, October 22 and 23 at Stade Uniprix. It featured toys, video games, movies, tabletop games, crafts, books, food and comics for kids; technology and educational toys for parents to check out; and inflatables and a costume parade for physical activity. LMCC PARTNERS WITH L’ORÉAL: To ensure that it stays on the cutting edge in the hair industry, Laurier Macdonald Career Centre in St. Leonard recently joined forces with industry giant L’Oréal,a partnership that will provide students with unprecedented knowledge. 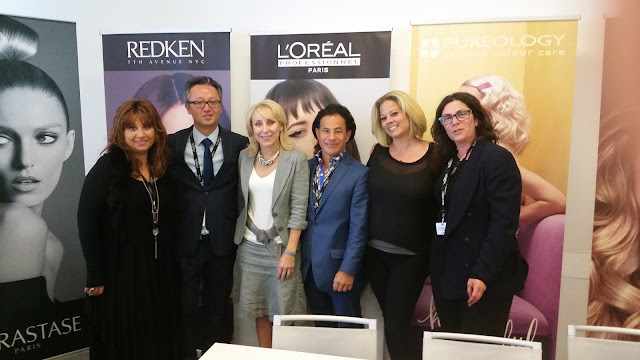 For both the Laurier Macdonald Career Centre and L’Oréal, the partnership will focus on strengthening the connection between the hair industry, vocational education, teaching and training methods. Professional development for teachers will include material, tools and digital technology for the Centre. Additionally, the project will further engage and develop talent, which will ultimately lead to retaining students in the industry. With this new partnership, students at Laurier Macdonald Career Centre will also participate in a number of exciting projects and opportunities, such as an Inspirational Day at L’Oréal, to see the corporation up close and what they have to offer and the annual Who’s Got Talent? contest; where as a bursary will be given by L’Oréal to the most talented hairdressing student. A recent study indicated that there is a great need for hairdressers in the Montreal area, stating that the market is missing 500 qualified professionals. Pictured are: Doriane Dalati, VP Canadian Strategic Market Development, L’Oréal Professional; Quoc Chay, President, Canadian Division, L’Oréal Professional; Lydia Landori, Assistant Centre Director, LMCC; Peter Tiscone, Hairdressing Teacher; Sonia Zuccaro, Hairdressing Teacher; and Antonella Anania, Hairdressing Teacher. GARDENS OF LIGHT: On October 13, the Gardens of Light at the Botanical Gardens captivated Galileo Adult Education Centre Common Core Basic Education (CCBE) students and teachers. The gardens were illuminated with over one thousand multicolored lights and lanterns. Students strolled along the paths that were decorated with a variety of glowing hues and cultural lanterns that each tell a different story. Their first stop was the Chinese Garden, enclosed by bronze cranes and turtles, which recounted the life of the Chinese Emperor and Beijing’s Forbidden City. Next, we stepped into the Japanese Garden where luminous bamboo installations awed the students and the soft glow lit up the beautiful Japanese Pavilion. The evening ended with a walk through the enormous green house and pumpkin exhibition where students admired the skillful work of local pumpkin carvers. It was a truly magical night for students, filled with mesmerizing visuals and captivating sights! A nice day for apple picking. HANDED-PICKED APPLES: Galileo CCBE and Social Integration Services Program (SIS) teachers and students spent a beautiful day picking apples in the gorgeous St. Eustache mountains. 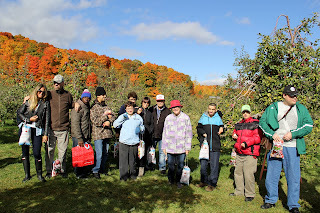 Most students are newly-arrived immigrants who have little knowledge of the Quebec tradition of apple picking. Students were exposed to a beautiful tradition of a tractor ride though the fields which allowed them to pick their own apples. Students were also giving the chance to visit the small farm and the boutique which also sold apples pies, cakes and other goodies. What delicious treats to bring home! POWER OF POTLUCKS: For many of us, the meaning of Thanksgiving usually includes feasting, a three-day weekend, football and family reunions. However, for newcomers to Quebec, the purpose behind this celebration can be a little obscure. In an effort to shed light on this holiday, Galileo CCBE teachers decided to educate their students by planning a Thanksgiving Potluck. This school-wide activity allowed teachers to introduce students to this North American holiday and simultaneously, have students share their own cultures with one another. The outcome was simply astounding! Each student contributed a homemade dish of food that was shared with his or her classmates. 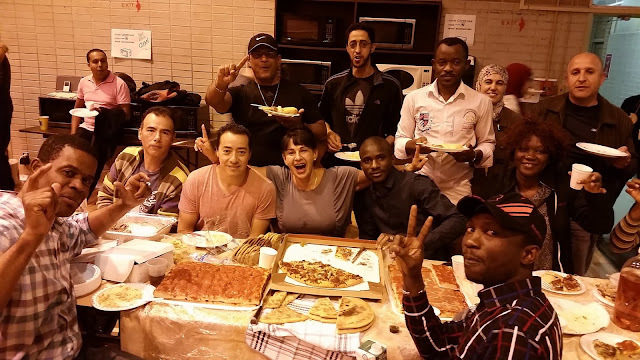 Students spent the evening feasting on dishes from over twenty different countries, dancing, socializing and celebrating with one another. This successful Thanksgiving potluck was a definite reminder of how valuable social events are for students. Encouraging opportunities for students to build community and friendships with one another are always conscious efforts at Galileo Adult Education Centre. This activity truly allowed teachers and students to give thanks as a school and granted newcomers the opportunity to feel truly welcomed into their learning community. 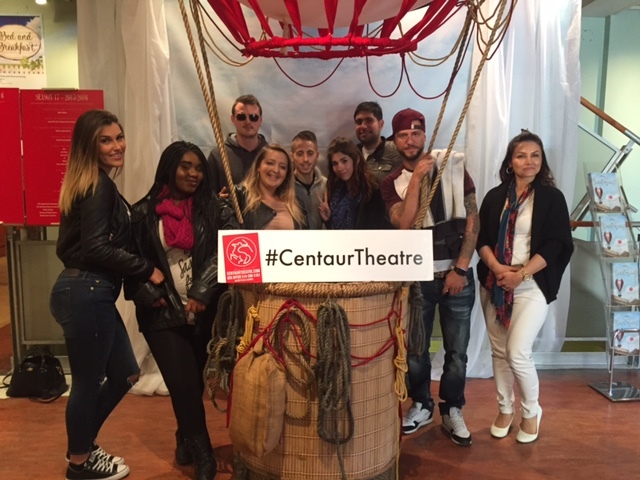 An enjoyable experience at the Centaur. CONSTELLATIONS: Lisa Trotto's Secondary V English students from Galileo saw stars while viewing Centaur Theatre's brand new play, Constellations. This field trip allowed students to further uncover the importance of theatrical techniques, the elements of drama and also gave them the chance to interact with the actors during a talkback session. Constellations took the audience on a fantastical journey to a multiverse where a physicist and a beekeeper seamlessly fall in love, over and over again, in infinite ways. Every choice the characters made during the play had a different and life-changing outcome in the final consequence of their actions. This allowed students to question whether our lives are a result of free will or fate. It was truly a romantic and intimate comedy bursting with love, friendship, destiny and honey! Viewing theatre productions and participating in dramatic arts education is a crucial means of invigorating students’ creativity in not only the arts, but in terms of problem solving as well. Not only can dramatic arts challenge students’ perceptions about the world and about themselves, but it can also serve as an outlet for their emotions, beliefs and dreams! FIRST FOX RUN: On September 28, all St. Laurent Adult Education Centre students and staff took part in their first Terry Fox Run. 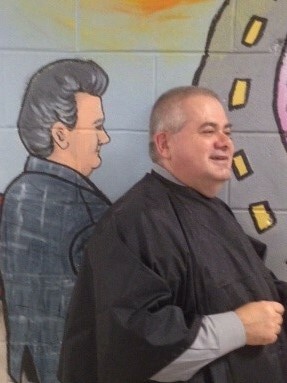 The centre set a goal to collect $700. The centre is happy to announce that they collected $840 to support a good cause. The staff looks forward to participating in more runs in the future and making this an annual activity. Meanwhile the school held its annual corn boil. Students and staff enjoyed sweet Quebec corn, ice cream and live entertainment. Two English teachers, Joseph Marques and Tom Patrick, formed an after-school mixed soccer team in early September. The students were excited to have a team and practiced several times per week. On October 20, the St. Laurent Stingers represented the EMSB at a soccer tournament in Kahnawake. The Stingers played other School Boards that took part in this tournament. It was St. Laurent's first time participating in this tournament and they won first place at the Adult Education Athletics Association Soccer Tournament (A.E.A.A). 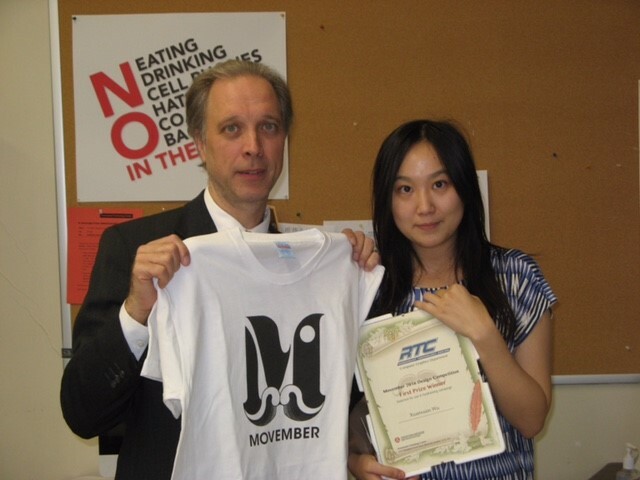 DESIGN CONTEST WINNER: Re-Education Councillor Paul LaPlante organized a design contest at Rosemount Technology Centre for a Movember T-Shirt logo. 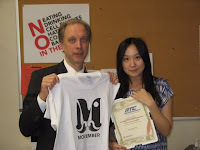 The winning logo was created by Xuanxuan Wu, seen here, with Rosemount Technology Centre Principal Harry Michalopoulos. PORTES OUVERTES – NOUVEAU SITE WEB: La CSEM a mis en ligne un nouveau site Web qui contient la liste complète de toutes les journées portes ouvertes dans ses écoles primaires et secondaires. On y accède au www.emsbopenhouses.com. ÊTRE BILINGUE: La CSEM est très heureuse de l’accueil positif qu’a reçu sa nouvelle campagne de promotion du bilinguisme. Lancé dans le cadre de la rentrée scolaire 2016-2017, le nouveau slogan de la CSEM « Être bilingue, c’est gagnant! » met l’accent sur le bilinguisme en tant que formule gagnante. La CSEM déploie à ce titre une campagne de publicité complète assortie d’affiches et d’articles promotionnels afin de diffuser largement son message. Conformément à la Charte de la langue française, un certificat d’admissibilité est remis à l’enfant qui reçoit ou a reçu la majorité de son enseignement en anglais dans une école primaire ou secondaire au Canada; à l’enfant dont le père ou la mère a reçu la majorité de son enseignement primaire en anglais au Canada; ou à l’enfant dont le frère ou la sœur a suivi ou suit la majorité de ses études en anglais dans une école primaire ou secondaire au Canada. FOIRE DES CARRIÈRES: Plus de 2 000 élèves de la 5e secondaire ont participé à la 17e foire annuelle des carrières de la Commission scolaire English-Montréal (CSEM) le mercredi 19 et le jeudi 20 octobre au Centre St. Pius X à Ahuntsic. Jack Dym de l’entreprise Pipe & Piling Supplies Ltd. et la RBC Banque Royale ont été les commanditaires de l’événement. La CSEM a également ouvert les portes de la foire au public le mercredi soir et des centaines d’élèves de 4e et de 5e secondaire y sont venus accompagnés de leurs parents. Karine Thomas, membre de l’équipe canadienne de nage synchronisée aux Jeux olympiques de Rio était sur place à titre de membre du programme Athlètes olympiques RBC et elle a partagé son expérience avec le public dans l’auditorium. Harriet Cohen des Services de l’éducation aux adultes et de la formation professionnelle (ÉAFP) de la CSEM est présidente de l’événement. Les Services aux élèves et l’ÉAFP coordonnent le programme. Mme Cohen indique que la foire des carrières a pour principal objectif d’offrir aux élèves de l’information sur l’éventail des possibilités de formation qui sont à leur disposition. Tous les élèves ont assisté à une séance d’information dans l’auditorium du Centre St. Pius X et ont ensuite visité les divers stands d’information et d’exposition tenus par des représentants de centres de formation professionnelle, de cégeps, d’universités et de certains collèges privés d’études en administration des affaires du réseau scolaire anglophone. C’est une visite au Kennedy Space Center à l’âge de quatre ans qui a éveillé la passion de M. Ewenson pour l’exploration de l’espace. Il n’y a pas d’âge pour trouver une passion. Ce message fait partie de chacune de ses présentations. Il offre des ateliers adaptés en fonction de l’âge de son public, ateliers mariant ses expériences personnelles, des activités scientifiques et l’interaction avec les participants. Les élèves peuvent ainsi acquérir des connaissances sur l’aérospatiale dans le plus grand plaisir. M. Ewenson est reconnu comme un éminent expert au sein du programme spatial canadien et de la NASA; on peut l’entendre à la radio et à la télévision et le lire dans les journaux. Il est « Educator Associate » pour l’American Institute of Aeronautics and Astronautics (AIAA) et membre du conseil consultatif de la SciEnteK-12 Foundation. En tant qu’éducateur, il a partagé ses expériences en aérospatiale avec plus de 100 000 personnes en Amérique du Nord, dans le cadre de présentations pratiques où il utilise du matériel authentique du programme spatial. Il possède l’une des plus imposantes collections personnelles d’objets liés à l’espace en Amérique du Nord et la met à contribution dans ses ateliers scolaires. Il peut s’adresser tant aux enfants de cinq ans qu’aux ingénieurs et aux scientifiques. Pour de plus amples renseignements sur M. Ewenson, rendez-vous au www.brianewenson.com ou suivez-le sur Facebook au www.facebook.com/bespaceman1. PREMIÈRE PELLETÉE DE TERRE AU CENTRE MACKAY: La cérémonie officielle d’inauguration des travaux de construction du nouveau bâtiment ultramoderne de 21,9 millions de dollars pour le centre Mackay et l’école Philip E. Layton aura lieu le mercredi 2 novembre, à 11 h. Le bâtiment sera érigé sur un terrain vacant situé rue Terrebonne, entre les avenues Benny et Madison, à NDG. La CSEM est propriétaire du terrain depuis des dizaines d’années, mais il est actuellement sous la responsabilité de la Ville et utilisé comme terrain de jeu informel par l’école primaire publique Marc-Favreau de la Commission scolaire de Montréal (CSDM) qui se trouve à proximité. Le bâtiment accueillera quelque 200 élèves ayant des troubles du développement, ou une déficience visuelle, auditive ou intellectuelle. Ce sera la seule école à offrir des services d’adaptation scolaire et de réadaptation à la communauté anglophone au Québec, et tous les élèves des neuf commissions scolaires anglophones du Québec y auront accès. Certains d’entre eux devront donc consacrer plusieurs heures par jour au transport scolaire. DÉCISION CONCERNANT LE PARC SINCLAIR-LAIRD: Le conseil des commissaires de la CSEM a écouté les doléances des parents et abandonne le projet de vendre une partie du parc entourant l’école primaire Sinclair-Laird à Parc Extension à une garderie privée. Le 26 septembre, la CSEM a tenu une réunion d’information pour les parents des enfants qui fréquentent l’école Sinclair-Laird afin de les consulter à propos de la possible vente d’une petite portion de la cour d’école au propriétaire d’une garderie privée qui souhaitait bâtir une nouvelle installation sur le terrain de l’école. Les membres du conseil et les représentants de la CSEM présents ont exposé cette demande aux parents et leur ont permis d’exprimer leur opinion et de poser des questions à ce sujet. Les parents ont été invités à remplir un court sondage pour indiquer si la CSEM devait soit poursuivre les discussions avec la garderie et utiliser les recettes de la vente pour apporter des améliorations à la cour d’école, soit mettre un terme au processus. Les 34 parents présents à la réunion ont rempli le sondage et ont tous opté pour la cessation du processus. La grande majorité des parents ont indiqué vouloir conserver le parc en tant qu’espace vert pour l’école et la communauté. La direction a présenté les résultats du sondage à la dernière réunion du conseil des commissaires le 28 septembre. Le conseil a convenu de cesser les discussions avec la garderie sur-le-champ et de préserver l’espace vert comme cour d’école et parc. La présidente de la CSEM, Angela Mancini, a remercié la communauté pour son importante contribution. « Le conseil continuera à travailler avec les communautés scolaires afin de répondre le mieux possible aux besoins des élèves et des parents », a-t-elle dit. MON SERVICE DE GARDE PHYSIQUEMENT ACTIF: La Direction régionale de santé publique de Montréal, en collaboration avec les cinq commissions scolaires de Montréal, encourage tous les services de garde en milieu scolaire à faire bouger les enfants au moins une heure par jour, dans des environnements sécuritaires et ludiques. Les enfants qui s’amusent bien… apprennent, réussissent et progressent bien. Voici cinq trucs pour encourager les enfants à adopter un mode de vie physiquement actif : demander aux enfants quels sont les types d’activités physiques auxquels ils aimeraient s’adonner au service de garde; emmener les enfants dehors le plus souvent possible; offrir des activités dans différents environnements (gymnase, classe, cour d’école, parc, etc. ); et encourager les enfants à participer à des activités physiques en mettant l’accent sur le plaisir qu’elles procurent. Le comité du projet Mon service de garde physiquement actif a produit une série de six vidéos – trois en anglais et trois en français – avec le soutien financier de participACTION. Le lancement officiel des vidéos a eu lieu le 30 septembre. FORMIDABLE COLLECTE DE FONDS TERRY FOX À L’ÉCOLE WILLINGDON: À l’école primaire Willingdon à NDG, une enseignante d’éducation physique particulièrement dévouée et appréciée, Lara Belinsky, a organisé l’édition 2016 de la course Terry Fox. Elle s’était engagée, si on doublait les dons et en portait le total de 8 500 $ à 15 000 $, à se raser la tête. Le fait qu’elle possède une chevelure noire abondante et bouclée dont l’épaisseur, une fois brossée, totalise 30 cm de part et d’autre du visage était certainement apte à motiver les troupes! L’école a largement dépassé son objectif, récoltant 26 570 $. Le vendredi 14 octobre, Mme Belinksy s’est fait raser la tête par des élèves en coiffure du Centre de formation professionnelle Laurier Macdonald de la CSEM, à Saint-Léonard, tandis que d’autres membres du personnel remplissaient leur propre engagement. Kathleen Usher, enseignante de science, a embrassé la tortue de l’école (pour 8 000 $); Jonathan Stein, enseignant en éducation physique et partisan indéfectible des Bruins, a arboré les couleurs du CH toute la journée; Nick Batzios, enseignant de musique, s’est habillé en rock star; Vito Campell-Guerriero, directeur adjoint, s’est fait entarter (pour 13 000 $); et Carmen Nicolas, directrice, s’est livrée à une performance de karaoké devant toute l’école. La veille de l’événement, Mme Belinsky et Mme Nicolas avaient été invitées à l’émission The Night Side avec Natasha Hall à CJAD. CONFÉRENCE DE LA FQAFÉ: La Fédération québécoise des associations foyers-écoles (FQAFÉ) tiendra sa conférence d’automne le samedi 5 novembre à l’école secondaire Beaconsfield (250, rue Beaurepaire) de 8 h 30 à 15 h 30. La conférence a pour thème Learning The Lessons of History: Creating A New Narrative for Canada. Nakuset, directrice générale du Foyer pour femmes autochtones de Montréal, créatrice, productrice et animatrice de la série télévisée Indigenous Power, y prononcera l’allocution principale. Le programme de la conférence comprend aussi un panel sur la refonte des programmes d’histoire et de sciences humaines au primaire et au secondaire au Canada. Quels sont les pans de notre histoire qui ont été ignorés ou carrément oubliés? L’un de ces pans est sans nul doute la relation inavouée du Canada avec ses peuples autochtones. Le temps de la vérité et de la réconciliation est largement venu. Un éminent panel d’éducateurs exposera les raisons pour lesquelles il faut changer notre trame afin de comprendre qui nous sommes en tant que nation. Nos enfants méritent de connaître la vérité. L’enseignant de l’école secondaire Westmount High, Robert Green, est l’un des panélistes invités. Selon lui, le Québec a besoin d’un programme d’histoire centré sur sa majorité francophone qui fait toutefois place aux importantes contributions de ses communautés minoritaires. Les ateliers suivants sont au programme : Cultivating and Enhancing your child’s self-esteem; Uncovering the Mysteries of Anxiety; et Volunteering Matters - Mission Driven Volunteering. Un atelier en littératie sera axé sur le programme Quebec Reading Connection et un autre se penchera sur la question de savoir si les livres dans nos écoles reflètent la diversité et les identités culturelles de notre société. Frais d’inscription : 25 $ pour les membres de la FQAFÉ et 35 $ pour le grand public. Information : sheiladesormeaux@qfhsa.org, 514-481-5619 ou www.qfhsa.org. JOURNÉE INTERNATIONALE DE LA PAIX : Afin de souligner la Journée internationale de la paix qui a lieu chaque année le 21 septembre, les élèves de l’école secondaire Perspectives I participeront à un nouveau programme pour promouvoir la dignité, le respect et l’égalité. Ce programme sera supervisé par Barbara White, responsable d’école à Perspectives I, Claudia Ciavaglia, tutrice d’élèves, Stephanie Gervasi, enseignante à Perspectives I, et Vince Lacroce, animateur de vie spirituelle et d’engagement communautaire. Les élèves apprendront d’abord les rudiments du yoga et de la méditation. Les activités de yoga visent à montrer aux élèves l’importance de développer leurs qualités physiques (force, flexibilité et coordination) et à leur faire bénéficier des avantages qu’il procure sur les plans mental et émotionnel (amélioration de la concentration, confiance et maîtrise de soi). Des périodes de méditation seront intégrées tout au long de l’année pour aider les élèves à se centrer, à mieux communiquer et à acquérir une clarté et une paix d’esprit. Les élèves créeront une œuvre en traçant le contour de leurs mains et en inscrivant des messages positifs sur eux-mêmes et les autres. L’œuvre circulera dans toute l’école. PEARSON ET NESBITT: Les élèves de 6e année de l’école primaire Nesbitt et du conseil étudiant de l’école secondaire Lester-B.-Pearson ont participé à un programme de deux jours axé sur l’empathie et le travail d’équipe. Ce programme réunissait les deux écoles pour la troisième année consécutive. Les élèves de 6e année ont pris part à des activités brise-glace, de stimulation et d’apprentissage expérientiel, ainsi qu’à un atelier multidimensionnel contre l’intimidation. Les élèves de l’école secondaire avaient conçu ce programme d’activités de manière à promouvoir le travail d’équipe, l’autonomie, la responsabilisation et le respect, dans le but de fournir aux participants des outils utiles tout au long de l’année scolaire et au-delà. Ce programme est mené en collaboration par Jeunesse au Soleil, l’école primaire Nesbitt et l’école secondaire Lester-B.-Pearson. Il avait lieu au camp de Jeunesse au Soleil, dans un superbe environnement naturel où les élèves de l’école Nesbitt ont également pu s’adonner au kayak, marcher en forêt et faire griller des guimauves sur un feu de camp. Ils ont même préparé et servi eux-mêmes leurs repas, sous la supervision de leurs chefs enseignants. Tant les élèves du primaire que ceux du secondaire ont acquis, grâce aux expériences partagées et au mentorat, plus de sagesse, de maturité et d’autonomie. Tout le monde gagne à collaborer! CORRIDOR VERT: L’arrondissement de Montréal-Nord de la Ville de Montréal a signé l’an dernier une importante entente avec la Commission scolaire de la Pointe-de-l'Île (CSPI) et la CSEM portant sur la mise en œuvre d'un projet novateur de corridor vert dans le secteur compris entre les rues Pascal (nord) et Renoir (sud), le boulevard Rolland (est) et l’avenue Laurier (ouest). Dans ce secteur d’à peine un demi-kilomètre carré, on retrouve cinq écoles, deux parcs, la Maison culturelle et communautaire (salles de spectacle et d'exposition, bibliothèque), un aréna et une piscine publique. Plus de 6 000 écoliers, parents et enseignants y transitent chaque jour de la semaine. Les cinq écoles sont les suivantes : école primaire Gerald-McShane et école secondaire Lester-B.-Pearson de la CSEM, école secondaire Henri-Bourassa, école primaire Jules-Verne et école Carignan. Les détails du projet de corridor vert ont été dévoilés le 5 octobre, dans le cadre d’une visite des différentes stations qu’il comporte. Au cours des quatre prochaines années, des efforts considérables seront déployés dans ce secteur achalandé afin d’en faire un milieu de vie agréable et accessible, actif et convivial. Dans le cadre de l’entente, les deux commissions scolaires ont convenu de : siéger à une table de concertation constituée des trois parties à l’entente; participer à la production et à la mise en œuvre d'un portefeuille intégré de projets; définir les besoins en matière de verdissement, d'aménagement, de mobilité et de mobilisation; soutenir le développement d'un programme pédagogique et d'animation du milieu; collaborer avec les organismes du milieu qui pourraient être impliqués dans plusieurs volets de ce projet d'envergure; et réaliser un plan de déplacement scolaire. Les interventions réalisées pourraient prendre les formes suivantes : le verdissement par la plantation d'arbres et de verdure, l'agriculture urbaine et l'aménagement de zones ombragées; l'aménagement de passages et d’autres liens entre les écoles, les édifices publics et les parcs; l'atténuation des impacts de la circulation automobile; l'incitation au transport actif; la sécurisation des opérations d'embarquement et de débarquement des autobus scolaires; le marquage au sol; l’installation d'un nouveau mobilier urbain; et l’optimisation de l’usage des lieux publics. MOIS NATIONAL DES DIRECTRICES ET DES DIRECTEURS D’ÉCOLE: L’organisation Partenariat en éducation a lancé ce mois-ci une nouvelle initiative, le Mois national des directrices et des directeurs du Canada. Nous savons tous que les grands directeurs et directrices font de grandes écoles et peuvent avoir un impact considérable sur les élèves, le personnel enseignant et la communauté. Partenariat en éducation a mené une campagne de relations publiques pour faire mieux connaître le rôle essentiel que jouent les directrices et directeurs au sein des écoles publiques et des communautés partout au pays, et a déclaré octobre 2016 comme le premier Mois national des directrices et des directeurs du Canada! Pendant le mois d’octobre, vous êtes tous invités à prendre part à la campagne en soulignant les accomplissements des directrices et des directeurs exceptionnels dans votre réseau, et à partager vos histoires et anecdotes sur Twitter en utilisant le mot-clic #OutstandingPrincipals, tout en incitant les autres à faire de même. Vous pouvez aussi soumettre la candidature d’une directrice ou d’un directeur remarquable pour le prix Canada’s Outstanding Principals (directrices et directeurs remarquables au Canada), le seul prix national et programme de perfectionnement du leadership destiné aux directrices et aux directeurs d’école au Canada. SEMAINE ÉDUCATION MÉDIAS : La Semaine éducation médias a lieu du 31 octobre au 4 novembre. Cette année, le thème de la Semaine est Produire et créer. HabiloMédias, de concert avec son partenaire la Fédération canadienne des enseignantes et des enseignants, célébrera la façon dont les parents et les enseignants peuvent aider les jeunes à devenir plus créatifs et novateurs et à avoir l’esprit d’entreprise, en adoptant la production médiatique, le remixage, la création, la culture « faites-le vous-même » et le codage. Les écoles peuvent participer de différentes façons à la Semaine, entre autres : promotion de la Semaine dans leurs réseaux de communication; organisation d’un événement, y compris un événement virtuel comme un webinaire ou une discussion sur Twitter, ou participation à un événement de ce type; production de contenu, de façon autonome ou en collaboration avec HabiloMédias et d’autres partenaires; participation ou collaboration au lancement (information à venir); offre de ressources existantes pour les événements; et soutien de la Semaine en tant que commanditaire. Info : Alex Hosselet, gestionnaire des communications, HabiloMédias 613 224-7721, poste 231. AHosselet@mediasmarts.ca. JARDINS DE LUMIÈRE : Le 13 octobre, les Jardins de lumière de l’Espace pour la vie de Montréal ont captivé les étudiants et le personnel enseignant du centre d’éducation des adultes Galileo. Ils ont déambulé le long des sentiers des jardins illuminés par plus d’un millier de lanternes multicolores racontant chacune une nouvelle histoire. Dans le Jardin de Chine, entourées de grues et de tortues de bronze, les lanternes illuminées relatent la vie de l’empereur de Chine et de la Cité interdite de Beijing. Dans le Jardin japonais, des installations lumineuses faites de tiges de bambou ont émerveillé les étudiants, tandis que leur douce lueur éclairait le Pavillon japonais. La soirée s’est terminée par la visite de la Grande serre d’exposition et du Grand bal des citrouilles où les étudiants ont pu admirer les talents infinis des décorateurs de citrouilles de la région. Ce fut une soirée magique pour les étudiants, remplie de découvertes envoûtantes et captivantes! LA FORCE DU PARTAGE: Pour la plupart d’entre nous, l’Action de grâce rime avec repas gastronomique, fin de semaine de trois jours, football et rassemblement familial. Or, pour les nouveaux arrivants au Québec, la raison d’être de ces célébrations peut être assez obscure. Afin de démystifier cette fête, les enseignants du centre d’éducation des adultes Galileo ont décidé d’organiser avec leurs étudiants un repas-partage d’Action de grâce. Cette activité a permis aux enseignants de faire connaître cette fête nord-américaine à leurs étudiants, et aux étudiants de partager un pan de leur culture les uns avec les autres. Elle a remporté un succès extraordinaire! Les élèves ont tous apporté un plat maison à partager et ont passé la soirée à se régaler en découvrant des plats de plus de vingt pays différents, en dansant, en socialisant et en célébrant tous ensemble. Le succès de l’événement est venu rappeler à quel point les activités sociales sont importantes pour les étudiants. Le centre d’éducation des adultes Galileo déploie d’ailleurs des efforts constants pour offrir à ses étudiants des occasions de développer leur sentiment d’appartenance à leur communauté d’apprentissage et de nouer des liens les uns avec les autres. C’est exactement ce qu’a permis cette activité. The next Focus will be published on November 24. Submissions should be made to Michael J. Cohen preferably by e-mail (mcohen@emsb.qc.ca) by November 17 at Noon. Just want to say that the publication - the EMSB Focus Newsletter - is, indeed, a first class production!